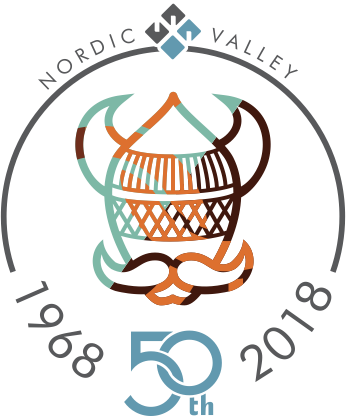 We are helping Nordic Valley Ski and Summer Resort celebrate their 50th anniversary with a 7k trail/snow race. Runners will grind up the wintery slopes of Nordic Valley for 1.2 miles and climb 1,000 feet before entering the rolling downhill of the forested fairyland of Pine Creek Canyon. After enjoying 2 miles of Pine Creek canyon runners will return to the the Nordic Valley Slopes. The course will be marked with ribbon, course signs, and we will have course marshals assisting at confusing intersections. The race begins at 8am which is one hour before the ski resort opens. We anticipate all runners to be at the top of the mountain and entering Pine Creek Canyon before the chair lifts open. When the runners return to the ski slopes there will be a good chance that skiers/snowboarders will be on the slopes at the same time. To minimize the risk we will ask runners to stay to the side of the ski run. It’s not often you get to participate in an actual winter trail race where there’s snow on the ground the entire time, that’s one of the unique things about the Nordic Valley 7k! To minimize foot slippage we recommend that you wear microspikes. Both Kahtoola and Yaktrax make awesome spikes that just slip over your normal running shoes. The historical average for the third Saturday in December for Nordic Valley is a high of 37° F and a low of 23° F. Keep an eye on the forecast the week leading up to the event and be prepared for any winter conditions (Snow, Rain, Sleet, Hail, Sub-Zero Temps, Bone Chilling Cold Winds). Dress in layers that will wick moisture away from your body. Remember cotton is not acceptable for layering. If you’re still unsure of what to wear head down to the Amer Sports Outlet in Ogden Utah and there friendly staff will help you get outfitted for winter running.